Of all the things we use electricity for, I think the most useful is for our refrigerators and freezer. I've wondered before how Southerners stored food before electricity; I have such problems with mold, mildew, and pantry moths that if it wasn't for these appliances, I'm not sure what I could keep that would be fit to eat. Another benefit is being able to toss in things like tomatoes, blueberries, and elderberries at the peak of harvest to process later. (For how to easily peel tomatoes by freezing them, scroll down to "Tomatoes" in this post.) With our temperatures being the coldest ever, I've needed a project that keeps me close to the stove. Emptying the freezer of all those fruits for jam and jelly making is the perfect project. For the first time since I planted them, I have an abundance of elder- berries. This year, I wanted to try elderberry jelly. It was a first for me. First batch of elderberry jelly. The recipe made 5 half-pints. Besides that, I used Pomona's Universal Pectin for the first time. I've been aware of it for many years, but due to no local availability and cost, I've never used it. Recently, however, I had to make a trek to our area Whole Foods and saw it there. 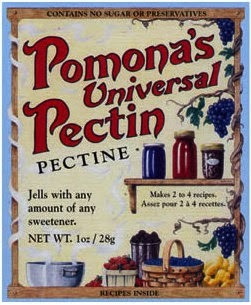 Considering how the cost of grocery store brands of pectin has skyrocketed, Pomona's was actually more economical because I can make up to four batches per box. I ended up with seven cups of elderberry juice. I made one batch (4 cups) with pure elderberry. I had to make up one cup for a second batch, and had enough muscadines and sand cherries in the freezer to make that much juice. The result was a mixed fruit jelly. Both jellies are very good, but won't replace straight muscadine jelly on my favorites list. Still, I like my jellies and I like keeping warm by the wood cookstove! It's a win-win for this kind of weather. Great idea to can in cold weather! I also love freezing fruits and vegetables to be able to can them during the winter - in fact, I recently posted a recipe for homemade pizza sauce from garden tomatoes I just pulled from the freezer at http://beesandapples.blogspot.com/2014/01/the-2-secrets-to-canning-tomatoes-easy.html. I have just started preserving my harvests over the last couple of years. You are right grocery store pectin can be expensive. I will have to pay more attention when Igo to Whole Foods to check this brand. Glad the elderberry jelly turned out well. Enjoyed this post. Thanks for sharing. Okay Leigh, now you made me homesick for my mother's elderberry jelly -- best ever! Cold here in SE Minnesota today, got snow last night and today feels worse with the wind chill. I am doing some cooking today, cottage pie in the oven, chili on the stove top and scotch eggs on deck. Stay warm! Last summer I did a bunch of stock, and threw it in the freezer. I need to get it out and can it now! While I'm not doing it on a wood stove, it will still keep the house warm (and boost the humidity, too!). I missed the window on elderberries this year, but located quite a large amount of them for next year. I want to make some syrup - it's good for lungs, and mine are my weakest link. Oh, how I miss my elderberries. In California a neighbor had some and in Massachusetts, I had enough to share with the birds. It grows wild on the roadsides there. I think it is time I get some here. Yum! I love the convenience of throwing things in the freezer to work with when you have more time! Your jellies look and sound delish...can't wait to make my own. How long had you had your elderberries before you got a good batch? I am planning to get some this year. Bettina, I thought about apple juice and should keep some around just for things like this. I hadn't thought to drink the juice! Nor soup. I reckon I've not even begun to scratch the surface for using elderberries. Renee, isn't the weather crazy! You've reminded me I still have the Thanksgiving turkey carcass in the freezer. Perfect for tomorrow's scheduled cold spell. Meredith, it's true, it's never in stores. And cheers for your pizza sauce! You're a woman after my own heart: freezing tomatoes for easier peeling, cooking down in crock pot, and making it pizza sauce instead of spaghetti sauce! Velva, I used to get my pectin off the clearance shelves at the end of the season; cheap! I haven't found it there recently and had to buy it full retail. Yikes! I happened to find the Pomona at Whole Foods baking section one time. Could possibly get it off Amazon with free shipping too (shipping too often hijacks an otherwise excellent price), I haven't checked or compared prices. The other option is to try to make my own! I did plant a crabapple tree for that purpose, but it's still too young to bear fruit. Laura, good point about humidity as well as warmth. In fact I left the the water bath canner on the stove all day for the humidity. Good point about elder being good for the lungs too. Another reason to make syrup. Barb, the birds are still competition! I need to find out how to propagate my plants. I'd love a whole hedge of elder. They are pretty to look at as well as food providers. Stephanie, you'll be making jams and jellies soon! We planted ours four years ago and this is the first year I've gotten a goodly harvest. As mentioned above, the birds love them too, so plant a lot! It sounds like the normal cutting method. My gooseberry and currant prunings are simply shoved into the ground up to their armpits in a shady spot. A year later, I dig them up and put them somewhere good. If they haven't sent up any growth, I give them an extra year. They tell you. They bud, or they don't. You can also layer the elders into a pot with a brick on it. It looks terrible in the landscape, but it works great for hydrangeas and the shoot-senders. I've never tasted elderberries before. This is something I need to put on my list to try. Canning in the cold weather sure saves on heating up the house. I love canning in the winter and filling up my pantry whatever I can can in the winter. Yummy on the jelly, and I agree with storing things in the south, not an easy task with the humidity. I have a box of this pectin that I haven't tried yet, but I'm glad to see you can use it with honey. Living among a large communtiy of Amish, I can say they do quite well preserving stuff without electricity or cold storage. Almost all their fruits and vegetables get canned as you would expect. They raise a lot of their meat fresh on the hoof and kill it as needed. But they also can a large portion of their meat in fat for later consumption. I've seen them can meat in five gallon pickle jars in fat and as they need some, they scrape off the protected layer of fat and dig out what they need leaving a layer of fat covering the lower layers to keep it protected. For grains, they seem to leave them whole for as long as they can and only grind up small batches as the need. Barb, thanks! That's exactly what I was hoping for. Sandy, they are pretty tasty and useful for jelly, syrup, and wine. The flowers are often battered and fried for a treat. I agree that canning really helps during cold weather! Candace, I'm tempted to buy some honey just to try canning with it. Of course, we plan to get bees someday, so hopefully we'll have our own source! Ed, interesting, especially about the meat in fat and the grains. I would love to know what equipment they use for threshing. That's been at the top of our list for grain success. I do think the midwest has lower humidity to deal with than we do, so hopefully less mold and mildew. I did a quick search and found this image that looks similar to the threshers used by the Amish. They are large ugly contraptions for sure. I haven't looked, but I'm guessing somebody out there makes a smaller portable thresher these days for people just as yourself. The alternative to that and what I would do, hire someone to custom harvest your plot for you and then all you have to do if store the grain. I'm guessing if you get it dried down to proper moisture content, you should be able to store it in air tight containers for a year no problem. I'm Gonna Be On Radio!